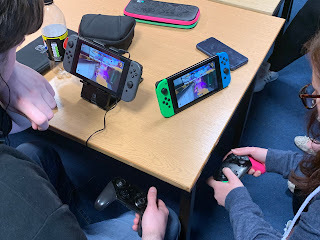 We decided that since this (mini) meet was so close to Easter, as well as the fact that Yoshi's Crafted World had just been released, we may as well do a FREE Easter Egg Hunt! We were also selling Easter themed cakes - dark crispie, milk chocolate shredded wheat nests and cornflake cakes for 50p each. The egg tokens ranged from "XL to XS" and were coloured according to their rareness. This time, the biggest egg (bronze) was the star prize, and the XS size ones were the more common light green and light blue colour. (and won you a creme egg or similar size) The 6 Yoshis got you a Lindt or Cadbury bunny, but if you found "Fat Yoshi" you got a slightly bigger Lindt bunny! There were rule sheets spread across the room, and we made sure people had read them before they started. If you wanted to enter you had to show Jen a Yoshi "thing". Get the go ahead, then take said Yoshi thing on the hunt with you. We had a few amiibo, some plushies, a CD case, and some figures of varying sizes. People were allowed in from 11.30, but for fairness, once people had been signed up, we waited until 12 before we started, so that everyone entering had a fair chance. 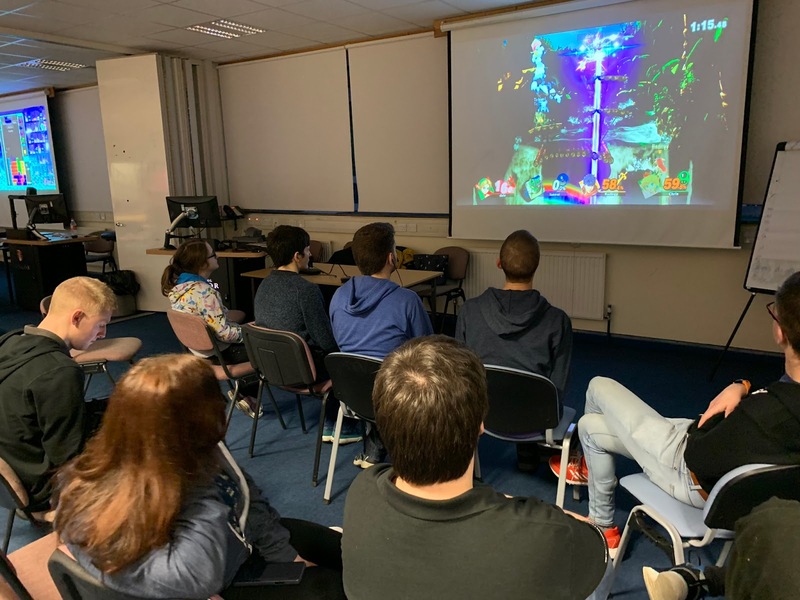 We also started with a bit of Yoshi's Crafted World on the big screen. There was a limit of up to 3, so that everyone had a fair chance of finding at least something. With the XS tokens being only just bigger than a 5p piece, it was supposed to be a challenge. People did keep looking, but no luck. In the end, those two "unknown" ones are apparently still in the room somewhere. I wonder when/if we'll ever find them...! The rest of the day was dedicated to freeplay like the rest of our mini meets. 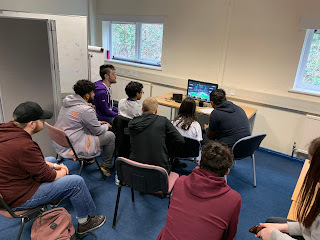 We saw a 12 player Mario Kart LAN session, plenty of Smash Ultimate, Baba is You, Blazblue Crosstag battle, Ultimate Chicken Horse and lots more! A group of Pokémon GO players also popped out because it was another community day, for catching Bagon! Some freeplay was set up to begin with, where we saw some Baba is You and Taiko no Tatsujin. 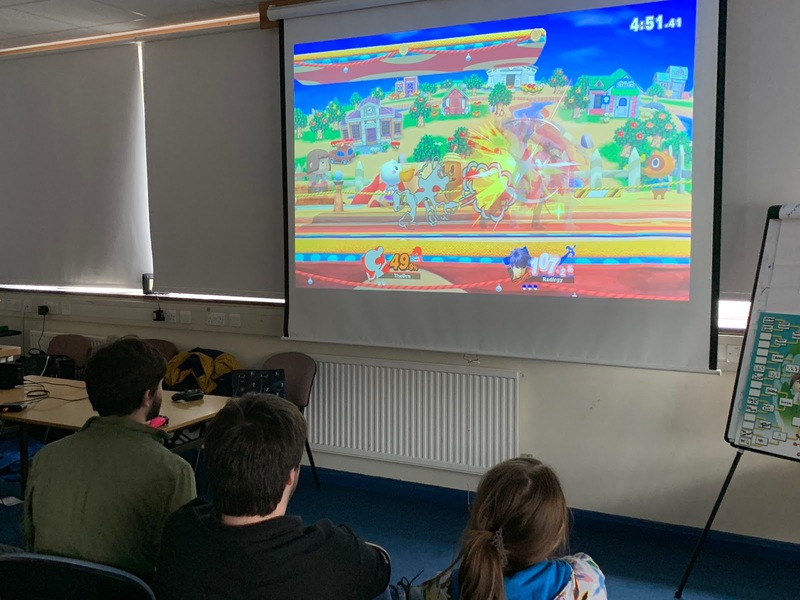 There was also Radirgy with his usual Smash Ultimate setup. We started around 11.30am, and had round 1 of the league. Today's first "game done differently" was Mario Kart 8 Deluxe. In mirror mode.... with a mirrored screen. It confused a few! 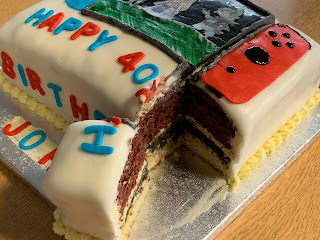 It was great fun though, and it gave everyone a chance too! Today's event wasn't the busiest we've done, but probably the most complex. We had 12 games in the tournament, but due to time it also had to be single elimination. 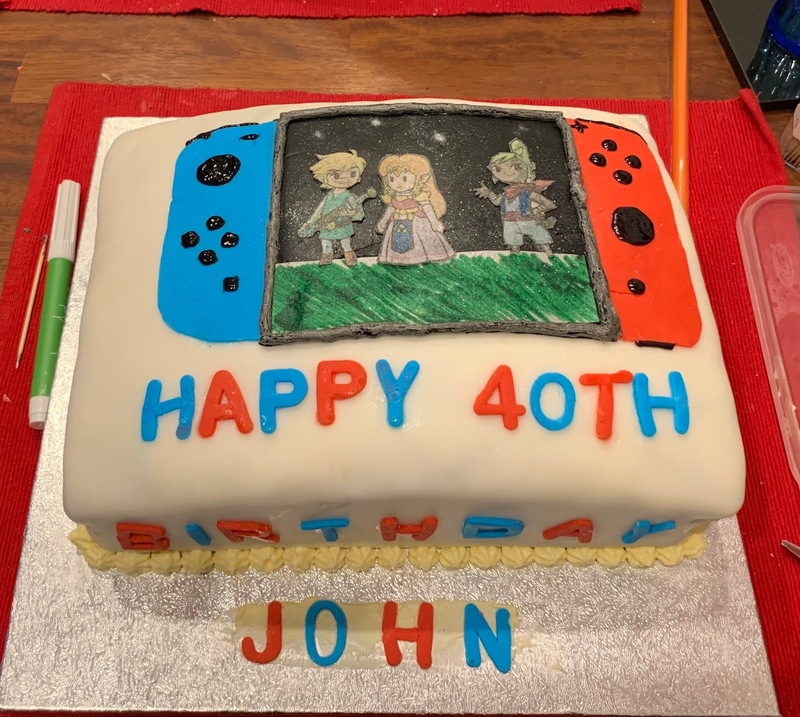 Once they were sat at their desired table, one person was asked to pick a card (out of 3) and the number on it corresponded to which game they needed to play. 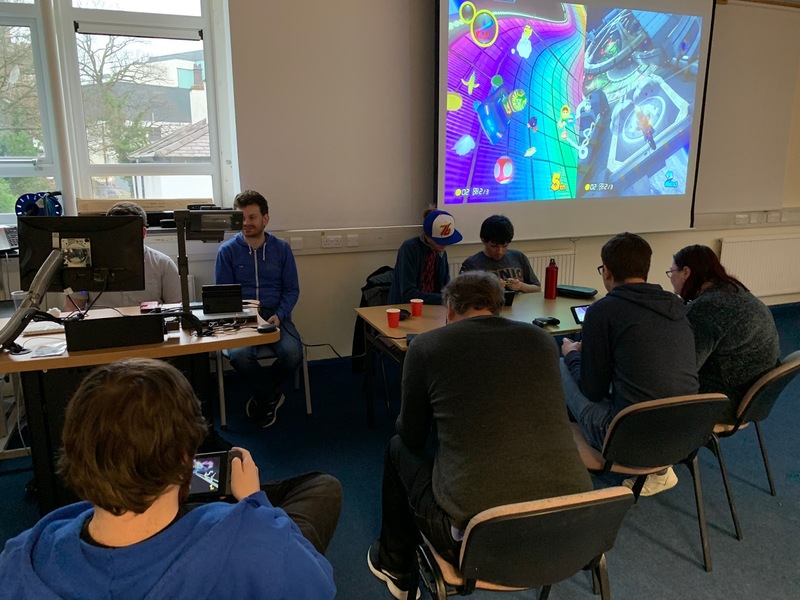 For the third round, and 7 people, we ended up with 3 tables with 2, and the 4th table with 1, so he automatically got through to the final! We saved the final for after the league though. It was a very tense finish, and fair dos to Radirgy who aced all the memory sections! However Drn came 1st and Dan came 2nd. 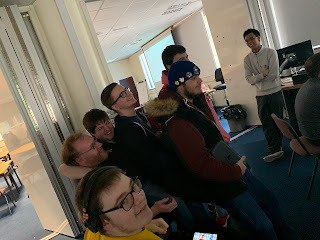 We did the raffle and group photo before the league tie breaker, so that we could finish on time for those who had to go. The tie breaker was Monopoly (Switch) - the first person to go bankrupt (Without pressing the bankrupt button!) It didn't take 3 hours like the original way of playing it, but it was a good 45 minutes. 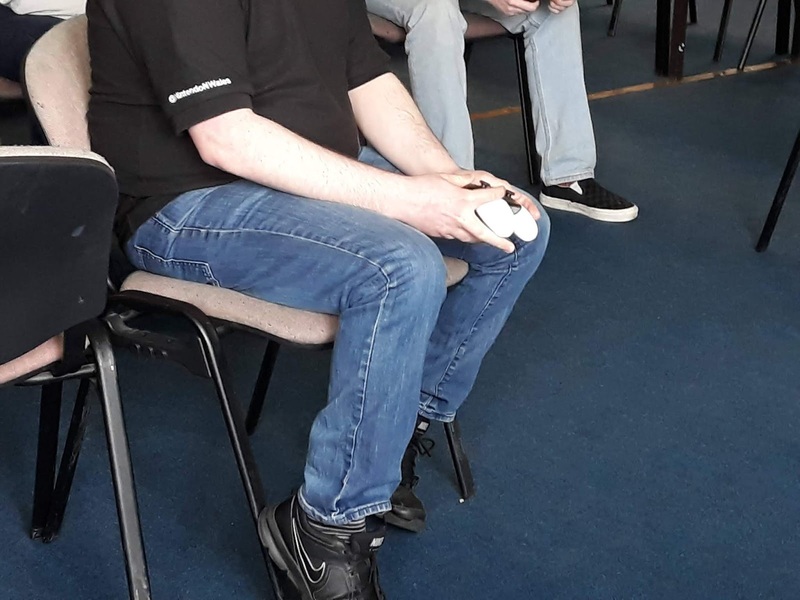 John won the session again, so well done to him! 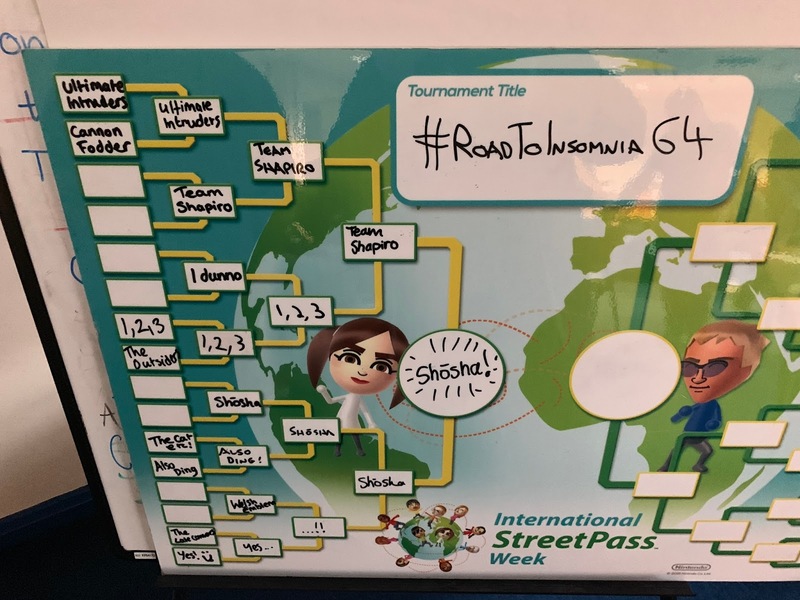 NPUK's Road to Insomnia64 is a series of 16 qualifiers across the country. The 16 winners gain tickets to Insomnia, and then fight it out for the final spot in the Top 4 final. The winner of that goes on to represent the UK & Ireland in the European cup! We had exactly 12 teams of 3 sign up. A few came as a trio, and others signs up as individuals, and made teams on the day. To give the admin time to sort out the teams, the event kicked off with round 1 of the new league season. This year the league theme is "Games done Differently" - so the games are announced in advance, but what's different about them? You have to wait until the day to find out! We started with Runbow, and it was fixed on the mode "Do a Barrel Roll" which meant that every item flipped the screen! The groups were in 6s or 7s, and the most common result was 3,2,1,0,0,0! We went straight on to the qualifier. This took up a large chunk of the day, but we tried to make sure anyone who got knocked out early had something to do, so we also put on a Mystery Challenge. 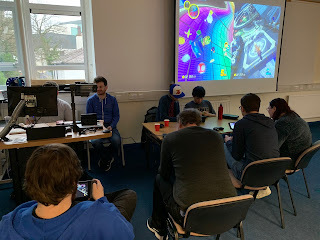 A Time Trial on Mario Kart 7 .... although most hadn't got the memo about bringing their 3DS, so we ended up changing it to Mario Kart 8 Deluxe since nearly everyone had their Switches with them! 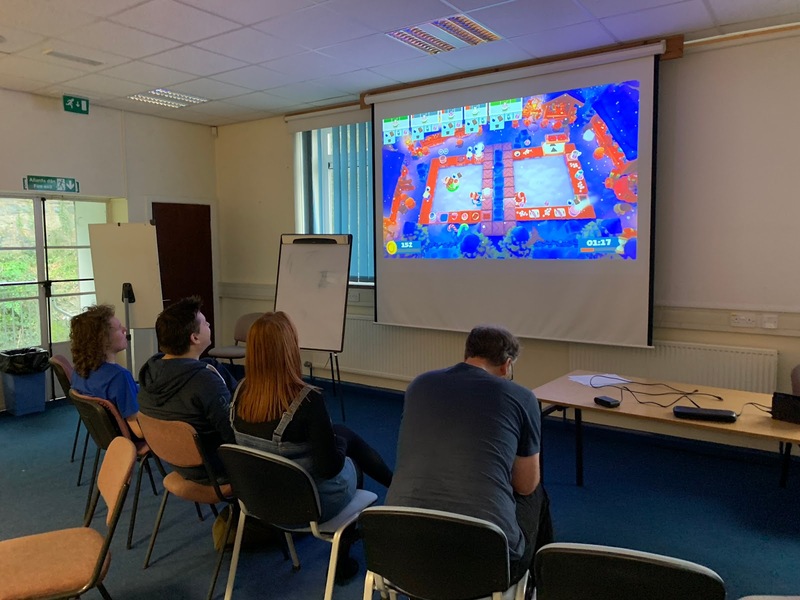 Of course, there's always chance for some freeplay, so we saw our usual table of Splatoon 2, and some Overcooked 2 on the other big screen. 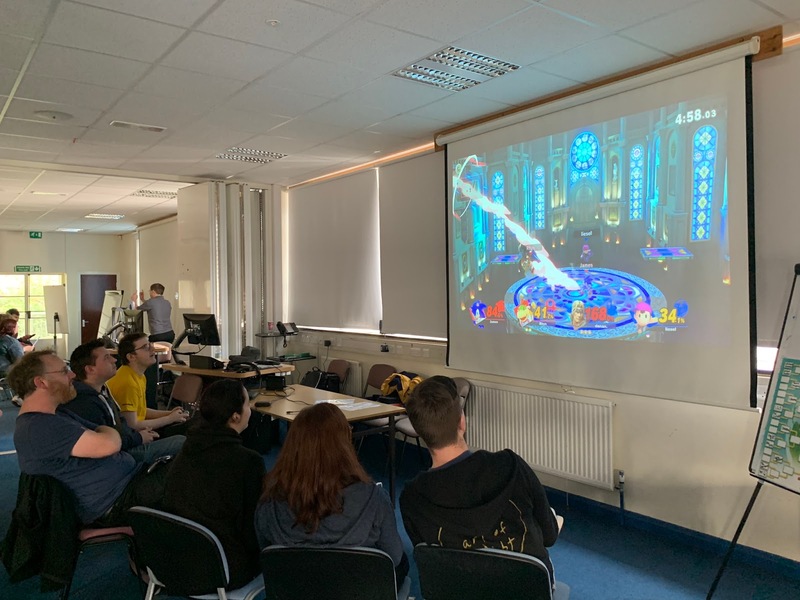 Things ran pretty smoothly for the Smash Tournament, and there were plenty of dramatic and tense moments. (Not going to forget that Kirby/Pit moment in the semi final...!) 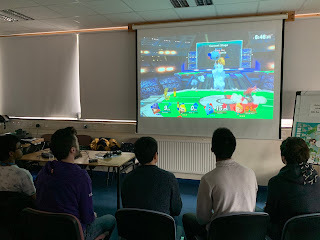 and the final was fought by two teams - one from the university's gaming league society (Team Shapiro), and the other team actually had an ex university student in it. (Ben also won a ticket when we did the Wii U Smash Qualifier back at the Christmas event in 2014!) Ben's team consisted of his friend Daniel, and also Tim, a regular around different NPUK groups. Ben's team "Shosha" came out on top with a 3-1 victory! The Challonge bracket can be found here: https://challonge.com/NNW_Road_to_Insomnia64. Round 2 of the league was up next, but we quickly realised we were going to run beyond schedule, so warned people as appropriate. Super Bomberman R was as expected, but with Dylan added in as a "troll"! He wouldn't lay any bombs, but he'd chase people if he picked up a disease, and if he was bombed, he would throw his revenge bombs from the sidelines! There were 4 groups of 6, and Dylan actually managed to win one of the sets! 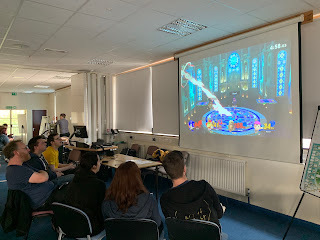 It was already 5pm by this point, so we made the decision to do the raffle before the final tournament, so that those who had to leave could leave! We also had a 5-way tie breaker for the league session, but due to time, we decided we'd contact those involved and arrange an online session for the eShop credit. 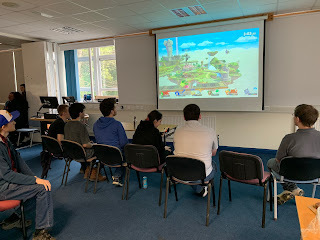 We still had the other Smash tournament to do, and 24 people were still happy to carry on, so we were there until 6pm! 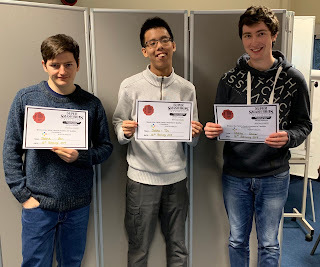 Ben and Jack were in the final, and Jack took the victory for the solo competition! 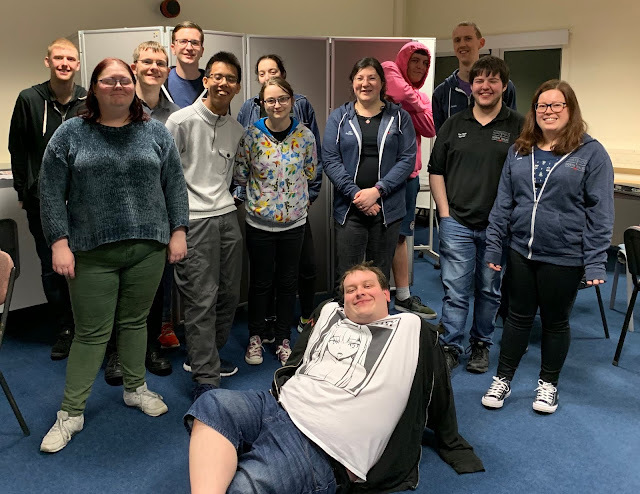 We still managed to have our group photo, but by that point not many were left haha! There's a reason why we say ALL times are approximate, and it's to cover cases like this. More people than expected, busier event, more happening = need more time! All's well that ends well though, and good luck to Ben's team at Insomnia! 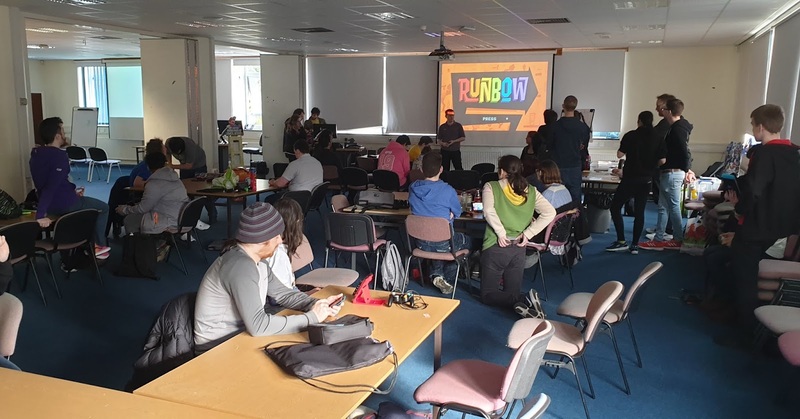 Our next event will take place on Saturday 23rd March, hope to see you there! We were supposed to be at the slightly shorter times of 11-4, but we were enjoying ourselves too much, so we stayed until 5 instead! 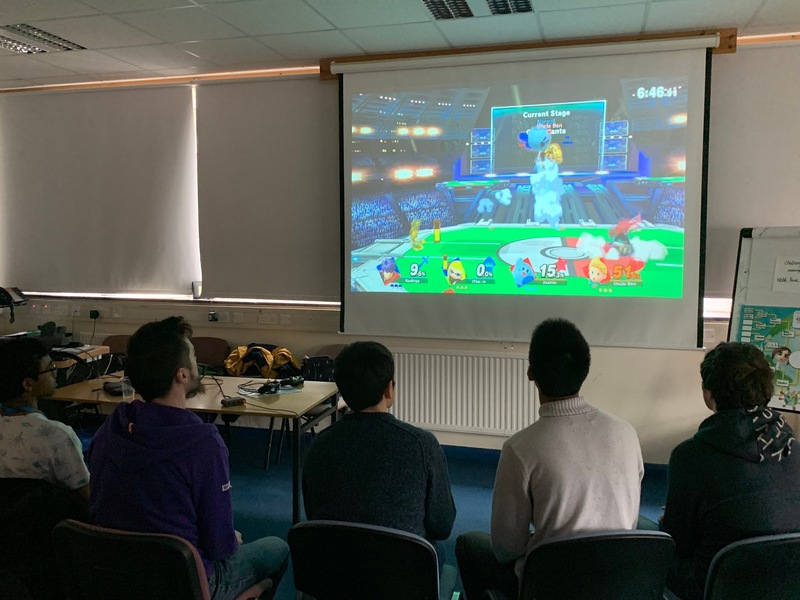 We also managed to get in some Pacman Championship, Overcooked 2, Mario Kart 8 Deluxe and Mario Kart 7 as decent multiplayer sessions. 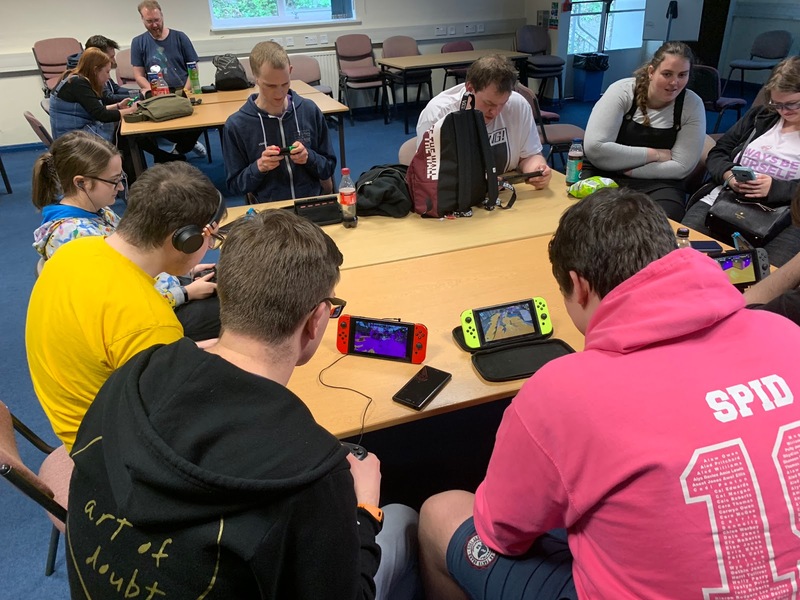 Other games were also played by individuals making use of the space too. 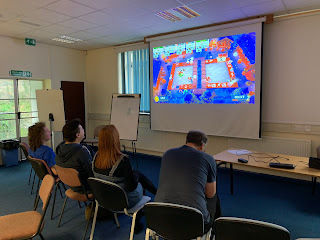 We tried Catastronauts, but Jen managed to set fire to herself and then run around setting fire to everyone else.... oops!! 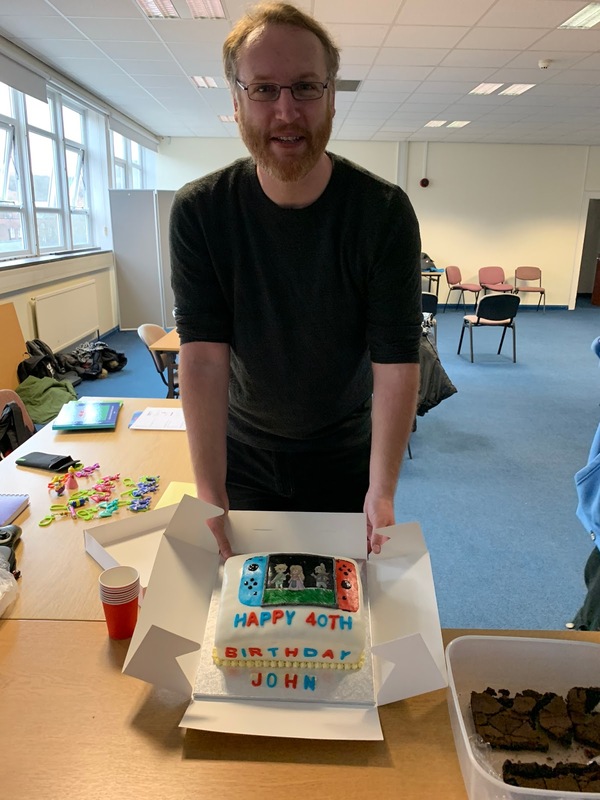 The big occasion was #Johnwinseverything's birthday! It was a special number, so we just had to make him a super special cake! 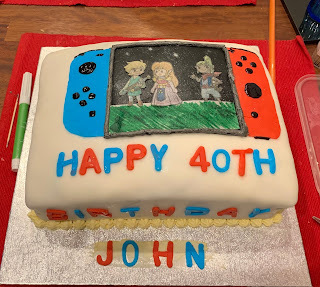 Thanks to Chant for the creation, and Emma for the help decorating it! We also got a sort of deja vu... sort of, because he was horizontal instead of vertical.... hmm...!